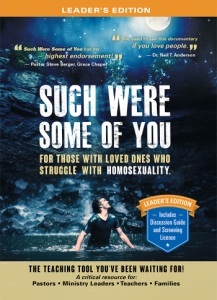 FRANKLIN, Tenn., July 15, 2014 /Christian Newswire/ -- Newly released documentary "Such Were Some of You" confronts the rising tide of popular opinion by chronicling the stories of 29 former homosexual men and women who say that Jesus Christ has transformed their lives. Experts in psychology, (Dr. Julie Hamilton), biblical scholarship (Dr. Robert Gagnon) and ministry (Dr. Neil Anderson) add their voice to the claim that people have been leaving homosexuality for millennia. Created to be used in Sunday School classes, support groups and other group settings, "Such Were Some of You" has been designed as a discipleship and equipping tool for the Body of Christ. The "witnesses to change" describe how they developed homosexual confusion, what the gay lifestyle was really like, how Jesus Christ set them free and the many ways that He has been healing and transforming their lives ever since. Participants include ex-gays from numerous ethnic backgrounds and age brackets, including one former gay activist who dramatically declares at one point, "I am free!" This two-hour documentary is available on DVD in a "Regular Edition" and a "Leader's Edition" (which includes a Discussion Guide and a license to screen the video in group settings). For more information, go to: www.SuchWereSomeOfYou.org and www.PurePassionMedia.org. Also available for screening in churches and conferences. For 27 years, Mastering Life Ministries has been creating teaching resources for sexually bound and broken people as well as for the larger body of Christ that help them more redemptively minister to friends and loved ones. Our radio, TV, and video productions have garnered Angel, Covenant and Telly Awards. For further information, contact Dr. David Kyle Foster (producer) at MLifeM@aol.com or by calling 1-615-507-4166. For a Press Kit, or to interview Dr. David Kyle Foster, contact Veritas Incorporated at 719.275.7775.